Thank you David for the invitation to participate in this opening ceremony. I am delighted to be here. Prof Ian Chubb AC, Chief Scientist of Australia, Dr Michael Chaney AO, Chancellor of the University of Australia, Chief Scientists gathered from various states and territories, Prof David Sampson, Director of the Centre for Microscopy, Characterisation which is the UWA node of both the Australian Microscopy & Microanalysis Research Facility and National Imaging Facility, invited guests and colleagues. I would like to congratulate the University and particularly David Sampson for partnering with both the AMMRF and NIF to establish the integrated microscopy and imaging facilities incorporating the new NIF Flagship MRI investment, here at the Harry Perkins Institute. It is always exciting to visit the nodes and see how they evolve with new “kit�? and to hear about the impactful research that is being enabled by combining world-class instruments with expert scientific and technical support staff. 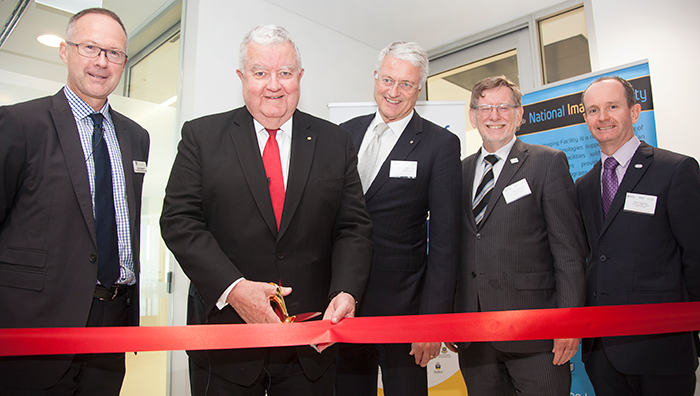 Not only does this facility further increase research infrastructure capability for researchers based in WA but it is integrated into a network of laboratories that form national capabilities in microscopy and microanalysis as well as imaging. Collectively these national facilities support well over 3,000 researchers annually from across Australia and overseas who produce truly world-class scientific outcomes and innovation. UWA continues to be a vital partner in the provision of these national networks. The integration of microscopy and imaging technology here in the Perkins Institute sits in concert with technologies in the CMCA that enable the characterisation of atoms and molecules, the chemical and structural identification of materials and minerals, cellular structure of living organisms, the organs that these cells combine to form and ultimately the complex systems that these sub-structures build, such as small animals, plants, ore bodies, man made material structures and devices. 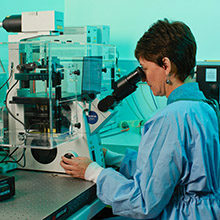 The journey that our users traverse in this facility is across several orders of magnitude – from the atomic scale, through nano, micro, milli and ultimately macro requiring highly complex instruments, excellent scientific and technical staff support and increasingly data, informatics and IT systems that enable data to become knowledge, information to become innovation. It is somewhat analogous to our astronomer colleagues who require highly-complex systems to delve deeply into outer space – the journey of our users, however, is into inner space enabling them to study the relationships between structure, properties and function of materials and living systems. 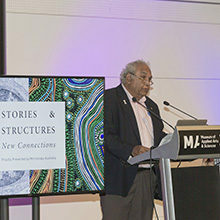 Understanding these relationships will help tackle societal challenges most relevant to Australia and which have been articulated in the recently announced Strategic Science & Research priorities developed by the Chief Scientist. I am sure Ian may make at reference to them later. Microscopy, microanalysis and imaging is essential to understand the origins of disease in our bodies, preventing its spread and ultimately curing the illness. It enables the discovery of new ore bodies and development of optimised processes for obtaining metals from the minerals. Studying the structure of plants helps us to understand the potential effect of climate change on our ability to grow food, enables new plant types for a changing environment and unlock the structure of compounds in fruits and seeds that could be the active ingredients forming the basis of new medicines for our families. New materials that underpin renewable energy technologies, improve water quality for the global population and innovative manufacturing technologies that will assist Australia to transform its economy to one based on smart, innovative manufacturing industries. The list can go on. Establishing integrated research infrastructure facilities such as these does not happen in an ad-hoc fashion but requires determined and strategic planning involving universities, research institutes, State and Federal governments and in this case, collaboration across national facilities. The creation of this facility and the investment in the MRI system and other platforms is well thought out. I understand that the Flagship MRI platform being launched today is a first for WA. It will be productive, yield impactful scientific outcomes and contribute to a return for the economy. What evidence to have for this statement? Last year the Federal Department of Education and Training commissioned KPMG to review research infrastructure facilities funded by the National Collaborative Research Infrastructure Strategy or NCRIS. The purpose of the review was to provide an objective assessment of the efficiency, effectiveness, governance, financial management, compliance and alignment to strategic policy of the facilities. Essentially how well do we deliver capability to our users. The results are in and the soon to be available public report will show that both the AMMRF and NIF scored very highly on the overall project maturity rating – with the AMMRF fully “optimised�?. What does this mean? It certainly does not reflect facilities that are in cruise mode, focussed on routine delivery of services and lacking any ability to evolve and align to changing researcher demands or priorities. On the contrary, it highlights the agility of the AMMRF and NIF to take account of changing needs and external factors. It also recognises our activities to monitor and measure our operations and implement initiatives that result in further improvement. Armed with this analysis and the quantifiable measures of research impact and outcome that we collect, as well as the stream of good news stories stemming from our users, I know that our facilities are working very well. If investment is to be made into new infrastructure it is into facilities operating at this level that it should be made. By investing into the AMMRF and NIF, national research infrastructure is highly utilised, availability and up time will be maximised, it will be scientifically supported, researchers will experience a professional user experience that enables a productive engagement and high-quality outcomes. Industry will have access to world-class infrastructure with clear modes of engagement that enable results to be translated efficiently. While the Federal government has been the primary source of funding for our facilities, significant institutional and in the past, state government, co-investment has been critical to get new capability “over the line�? and kept operational. The opportunity available to state governments to join with institutions and leverage Federal investment is real and will have a direct impact on the research capacity and the economic development of the states. It has, however, largely tapered off since the original NCRIS investment in 2007 and, apart from opportunities in NSW, has not been available in other states for recent rounds of CRIS and NCRIS funding in 2013 and 2015 as far as I can gather. State government co-investment in facilities such as this today will sustain the facilities. It will result in new jobs as experts, who are required to support instrumentation or provide informatics support, move to our cities. It will benefit industries as they access new facilities and will ensure the next generation explorers of “inner-space�? whose discoveries my lead to new technologies and the establishment of new businesses, are trained and educated using world-class equipment. For the assembled Chief Scientists can I take the liberty to encourage you to advocate to your respective administrations that programs need to be prioritised and funded that enable co-investment in research infrastructure. These contributions are valued highly by our facilities. From the AMMRF and NIF perspective it would be sound investment yielding a solid return that will benefit your states and the nation. This facility opening today is an exemplar of the highly efficient, open-access, user-focussed organisation that has a mission to provide best practice in operation and maintenance thereby enabling world-class scientific discovery and innovation. Well done UWA on this impressive facility. 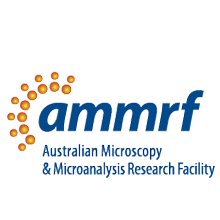 I am delighted that, in collaboration with NIF, it is part of the AMMRF and I look forward to hearing about the research journeys that are launched in this lab and the outcomes that I know will follow.